Mayas’ “Big ghosts in a cloud”, her “loud, barking dogs” and the hair-pulling, teasing school-girls that she speaks of are represented by Jean-Michel’s crude ‘scribbles’: the message is clear and simple. It is a tough world out there but no one should shy away from it. Luz Mosquera on ‘Life Doesn’t Frighten Me At All’, a poem of Angelou, illustrated by Basquiat. Life Doesn’t Frighten Me At All (1993) is a short poem written by Maya Angelou and illustrated by paintings of 1980’s artist Jean-Michel Basquiat. It is a short, simple but resonant book which blends Maya’s defiant and proud poetry with the raw, simple but lively and raucous child-like paintings of the poster-boy of the New York art-scene who came to the forefront of the Western art-world in a decade when the city became a cultural hub for artists from all backgrounds and mediums. The New York streets of Jean-Michel Basquiat’s youth, which fascinated him at an early age and help to color Angelou’s stirring words with an edginess hinted at the instability of Maya Angelou’s early childhood in the Deep South and her ongoing struggles as a marginalized black woman in America. The African-American experience is portrayed in two distinct styles by two distinct and very different artists linked by a common ancestry and the marginalization faced due to this background. 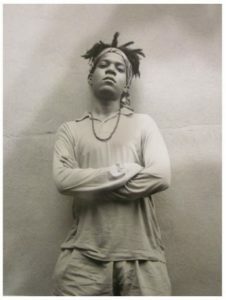 In Basquiat’s case, who was born to a relatively well-off family in a middle-class neighborhood of New York, his exposure to many of the dark and intimidating aspects of a city in the middle of an economic crises was voluntary – he became fascinated by the squalor of the impoverished scenes he encountered in New York city and immersed himself in it. His artworks, made from paint, oil stick, pastels and ink are cruel but childlike and almost crude in technique – a style that, while holding a mirror up to the world he had become immersed in, belittles and mocks it at the same time. Like Angelou, he presents a challenge to the dark obstacles faced by the marginalized in our society. 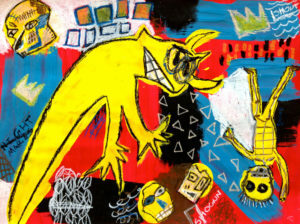 One of the illustrations of Jean-Michel Basquiat. From mysterious New York graffiti-artist to becoming Warhol’s latest obsession, Basquiat quickly and eagerly found himself catapulted to the forefront of the Western art-scene; but as the most successful black painter in America, his American upbringing is colored with the undertones of the despair experienced by all of the New York’s forgotten people and not just by his own experience growing up as a black child during the explosion of the 1960’s civil-rights movement. Angelou’s earnest and gentle (while still impossibly powerful) voice, comes from experience through a life-time of struggle and discrimination and overcoming these obstacles coupled with the often-stated egotism and thirst for fame that Basquiat was said to have displayed in his personality, do not seem like they could match-up well together, however, the two visions link up perfectly. Angelou herself was a major figure in the civil-rights movement and a clandestine understanding between the two distinct personalities seems to span a generational and personality-gap, which is highlighted through the blending together of both of their works. 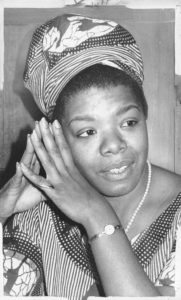 While most well-known for her autobiographical work I Know Why The Cage Bird Sings, Maya would dedicate her life to empowering the black community both in the West and in Africa, spending a significant amount of time in Ghana and Egypt as a journalist after struggling through a troubled upbringing and a string of the type of low-status jobs that her status only allowed her access to – from fry cook, to singing at seedy nightclubs. Angelou speaks from experience when she says she isn’t frightened by life. Even her childhood experience of overcoming becoming completely mute – which developed after an early trauma – through her fascination with the poetry of various artists of both the African and Western tradition. The African-American experience, while distinct, is also inseparable from the influences of the Western culture that surrounds it and this is one of the reasons that Life Doesn’t Frighten Me At All has the ability to resonate with readers of all backgrounds. The marginalization and trauma experienced by Maya’s early life and the urban-decay that so fascinated Jean-Michel in the 1970s and 1980s also comes to epitomise the hardships and difficulties faced by people across all demographics. The differing fates of both artists; with Jean-Michel’s early death in his late twenties and Maya’s survival through generations of struggle and breaking down racial barriers, culminating in the election of the first-black president still blend together in perfect harmony. Luz Mosquera is a London-based blogger, copywriter and freelance journalist. He is interested in African American contemporary culture along with its ancestral origins. He has traveled across East Africa and has contributed to local newspapers writing about cultural events and outreach community activities happening in deprived areas. His interests in African-American culture has lead him to further his interests in contemporary African arts spanning the entire East and Central African regions of the continent. In 2018 a hardcover reprint of the book will be published, 25 years after the first edition.